Fab Lab Connect initiated the creation of the first Fab lab in Corsica in March 2014. We created a public – private partnership to fund the Lab which was inaugurated a year ago. We are proud of the first Fab Academy students graduating soon. Check their photos with the Italian expert who came to help them through this 5 months MIT course. 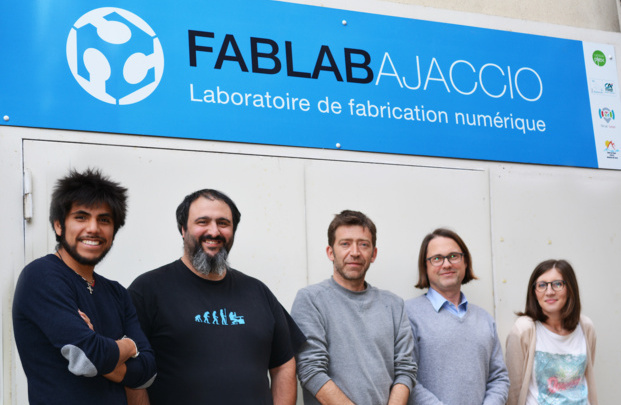 After six months of work, the four trainees of the first Fab Academy of Corsica presented the results of their work done with the advice of the Fab Lab of Ajaccio but also live lectures from the prestigious MIT. Part of a project awareness of the CBA, the Fab Academy has been open to all Fab Labs around the world.